Josh in our budget hotel in Hong Kong. We’ve made it through our first day in Hong Kong after arriving at 0630 this morning. It’s been 48 hours or more (I’ve lost track) since we had any real sleep so at current 8pm time we’re struggling to stay awake while watching NatGeo channel. Sensory overload contributes to our tiredness; there is so much going on in any one glance that its hard to walk very fast at all. With no shortage of food, we’ve sampled some Chinese cuisine including a fresh bakery pizza bun, mini chocolate muffin, and some wonton meatball soup. Our goal today was to wonder and pass time, for we were too tired to have a planned or scheduled adventure. We saw a lot of the Kowloon area including the ferry terminal, harbour city mall, and various areas of market streets (birds, flowers, pets, sporting goods, and shoes). 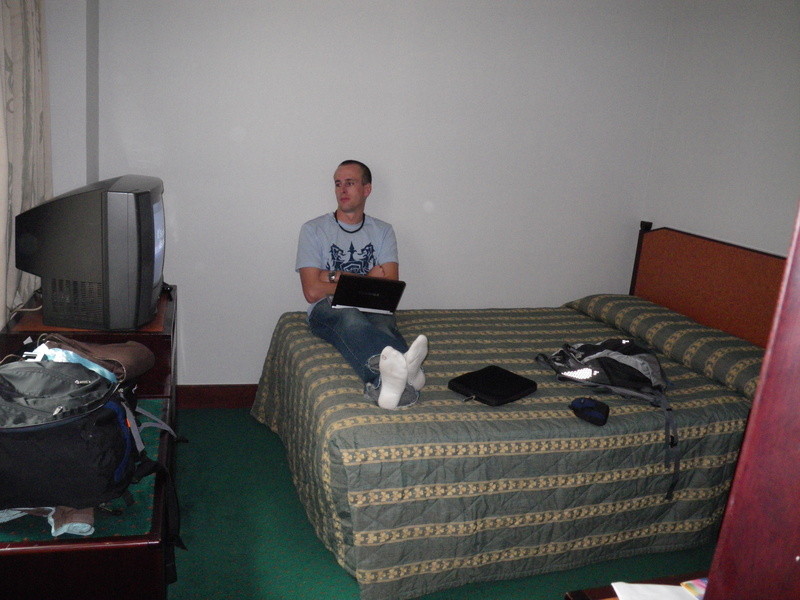 Our hotel (The Shamrock) is modestly modest, and the room is VERY small, but not quite unexpected. It’s clean, with a new bathroom, close to NathanRd and lots of food, shopping and the mtero. We had to hunt for an internet cable in the computer district (or pay daily for one at the hotel) and another charge for the actual internet service. Then we had a service guy come sit in our room for 10 minutes to figure out why it wasn’t working. The front desk called a few tmes to make sure it was working ok. What nice service. Anyway, my brain is virtually mush and isn’t thinking very well, so we’ll try again to blog tomorrow before our paid internet is cut off at 5pm. We have plans to go to Lantau Island tomorrow, and hopefullyVictoria Peak the next day, but that’s up to the weather. It’s forecasting rain for the next few days (which is nothing compared to what we suffered in Barcelona last year- a torential100 year rain), but if its anything like today, its a sporatic sprinkling mist. No jeans, and no shoes tomorrow. Yes.